Aftermarket Daily News Thursday, November 1, 2018 1 8 Dee Zee's Hex Series Cab Rack Dee Zee, Inc., the Quality Truck Accessory People, introduced the full line of Hex Series products at SEMA. Designed with customization in mind, Dee Zee's Hex Series includes a Cab Rack, Hoop Steps and Side Rails in three color options. Get the off-road look with unlimited functionality by adding Dee Zee's new Hex Series Cab Rack. The exclusive inte- grated channel design allows you to adjust the bars vertically for perfect placement and avoid interfering with the third brake light. The channel system also provides the ability to mount endless accessory options, so consumers can add accessories like lights and tie downs (not included). The Hex rack is made of smooth extruded aluminum and overlaid with powder coat protection to keep it looking new while matching other accessories on the truck. Customers can choose from three available finishes – silver, gloss black and textured black – to coordinate with other accessories on the truck. The Hex Cab Rack installs into existing stake pocket holes and no drilling is required. If they want a per- fect match, they can add Dee Zee's Hex Series Side Steps and Side Rails to com- plete the off-road look. Side Rails offer an extrusion channel the length of the truck bed for additional lights or tie down anchor points to secure cargo. Hex Series Side steps utilize the extrusion channel to place the step in the perfect location for a secure step up into the truck. Both accessories install without drilling into the truck bed or frame by using existing factory holes. Hex Side Step brackets are sold separately. To learn more about the variety of products offered by Dee Zee, visit www.deezee.com, follow @deezeemfg, call 800.779.2102 or stop by SEMA booth #30039. TECH R&D Broadens Injury Application Angle for Uni-Seal Tire Repair Product TECH's research and development team has been actively pursuing parent compa- ny TRC's 4r vison, to create and extract value from materials formerly considered to be at the end of their usable life. TECH's R&D team took this vision to heart by altering the materials and process utilized in the manufacture of its one-piece Uni-Seal truck and passenger car repair products. By increasing the injury and repair angle from 25 degrees to 35 degrees, it greatly increases the number of tires that are able to be repaired verses scrapped. According to TECH's Vice President of Technology Bill Johnson, "We were confident that with slight modifications to the chemical composition of materials and our manufacturing process we could increase the application of our Uni-Seal product." The TECH R&D team conducted rigorous road wheel testing with overloaded tires for over 240 hours using TECH's in-house endurance test protocol. In addition, it conducted FVMSS-139 tests and each tire was tested with multiple injuries which were at a minimum of 35 degrees or greater. All tires tested complet- ed the tests with a 100 percent success rate. TECH products have repaired billions of tires and it continues to leverage over 80 years of tire repair experience and expertise to innovate and set the industry standard for quality tire repairs. TECH – trusted by tire technicians around the globe for 80 years! To learn more about TECH, visit www.techtirerepairs.com or for more about TRC, visit www.trc4r.com. Stop by SEMA booth #40089 at the show. Expert Jury of the German Innovation Award Honors bluechemGROUP The bluechemGROUP receives an exceptional price for its innovative com- bustion chamber cleaning system Carbon X. The jury of the German Innovation Award 2018 awards the high- ranking Winner award in the category "Excellence in Business to Business – Chemical Industry" to the product that was presented last year. The great recog- nition, which is given by independent experts from industry, science, institu- tions and finance, honors the convincing innovation performance of the bluechemGROUP, which offers a rele- vant benefit, represents a decisive differ- entiation in the competition and signifi- cantly contributes to market success. "As a technology leader in vehicle chemistry with 30 years of experience, innovation strength, user-benefit orientation and cost-effectiveness have always been among our core values. Thanks to the German Innovation Award, our great achievements are now visible to a broad public," explains Werner Urban, President of the bluechemGROUP. The German Innovation Award is set up by the German Design Council, founded by the German Bundestag and endowed by German industry. Since 1953, this foundation has been commit- ted to the competitiveness of companies and holds various competitions for design, brand and innovation services of international standing. "Above all because of its high standards, its trans- parency and its independence – from the nomination to the awarding of prizes – the German Innovation Award provided the perfect opportunity to present the bluechemGROUP and its work across all industries," explains Urban. The evaluation criteria include for example the user benefits, the func- tionality and operability, the economic efficiency, the longevity and quality as well as the sustainability. What is Carbon X? With the help of the cleaning system Carbon X, the entire combustion cham- ber of an engine can be liberated of all operational deposits without the need for costly disassembly of the cylinder head. The unique chemical formulation is suit- able for both diesel and petrol engines, and removes even the most stubborn and hard-to-reach deposits in depth. The innovative cleaning system Carbon X noticeably improves the smooth running of the engine and optimizes the combus- tion of the fuel. 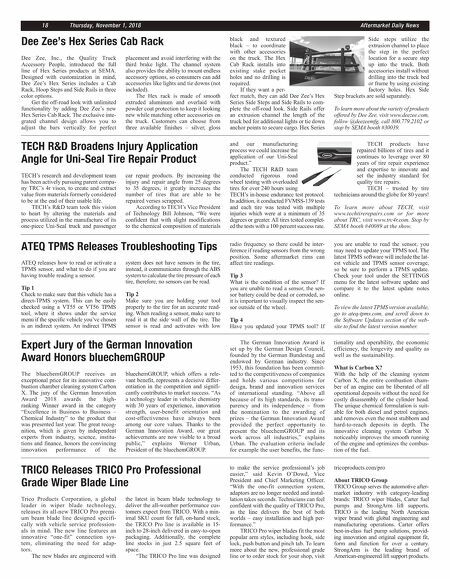 TRICO Releases TRICO Pro Professional Grade Wiper Blade Line Trico Products Corporation, a global leader in wiper blade technology, releases its all-new TRICO Pro premi- um beam blade line designed specifi- cally with vehicle service profession- als in mind. The new line features an innovative "one-fit" connection sys- tem, eliminating the need for adap- tors. The new blades are engineered with the latest in beam blade technology to deliver the all-weather performance cus- tomers expect from TRICO. With a min- imal SKU count for full, on-hand stock, the TRICO Pro line is available in 15- inch to 28-inch delivered in easy-to-open packaging. Additionally, the complete line stocks in just 2.5 square feet of space. "The TRICO Pro line was designed to make the service professional's job easier," said Kevin O'Dowd, Vice President and Chief Marketing Officer. "With the one-fit connection system, adaptors are no longer needed and instal- lation takes seconds. Technicians can feel confident with the quality of TRICO Pro, as the line delivers the best of both worlds – easy installation and high per- formance." TRICO Pro wiper blades fit the most popular arm styles, including hook, side lock, push button and pinch tab. To learn more about the new, professional grade line or to order stock for your shop, visit tricoproducts.com/pro About TRICO Group TRICO Group serves the automotive after- market industry with category-leading brands: TRICO wiper blades, Carter fuel pumps and StrongArm lift supports. 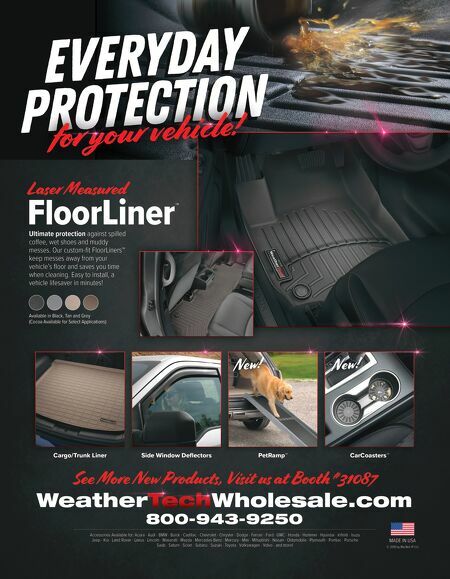 TRICO is the leading North American wiper brand with global engineering and manufacturing operations. Carter offers best-in-class fuel pump solutions, provid- ing innovation and original equipment fit, form and function for over a century. StrongArm is the leading brand of American-engineered lift support products. ATEQ TPMS Releases Troubleshooting Tips ATEQ releases how to read or activate a TPMS sensor, and what to do if you are having trouble reading a sensor. Tip 1 Check to make sure that this vehicle has a direct-TPMS system. This can be easily checked using a VT55 or VT56 TPMS tool, where it shows under the service menu if the specific vehicle you've chosen is an indirect system. An indirect TPMS system does not have sensors in the tire, instead, it communicates through the ABS system to calculate the tire pressure of each tire, therefore, no sensors can be read. Tip 2 Make sure you are holding your tool properly to the tire for an accurate read- ing. When reading a sensor, make sure to read it at the side wall of the tire. The sensor is read and activates with low radio frequency so there could be inter- ference if reading sensors from the wrong position. Some aftermarket rims can affect tire readings. Tip 3 What is the condition of the sensor? If you are unable to read a sensor, the sen- sor battery could be dead or corroded, so it is important to visually inspect the sen- sor outside of the wheel. Tip 4 Have you updated your TPMS tool? If you are unable to read the sensor, you may need to update your TPMS tool. The latest TPMS software will include the lat- est vehicle and TPMS sensor coverage, so be sure to perform a TPMS update. Check your tool under the SETTINGS menu for the latest software update and compare it to the latest update notes online. To view the latest TPMS version available, go to ateq-tpms.com, and scroll down to the Software Updates section of the web- site to find the latest version number.